Scroll to the bottom for a full list of articles in The Immigrants’ Civil War series. The army embarked on its ships on March 17, 1862, St. Patrick’s Day. This map shows the amphibious move by the Union Army of the Potomac (black arrows) by ship from Washington to Fort Monroe at the east end of the Virginia Peninsula. 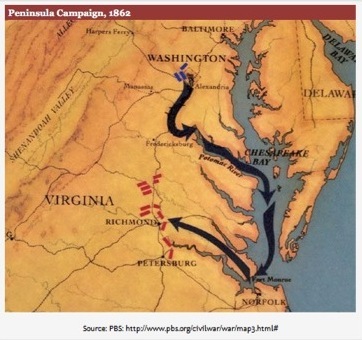 The army then moved overland towards Richmond. Irish Brigade losses were light, but as the immigrants came upon the field of battle the new recruits finally saw the gory cost of war. One of the men most affected was a Catholic priest serving as a chaplain of the brigade. 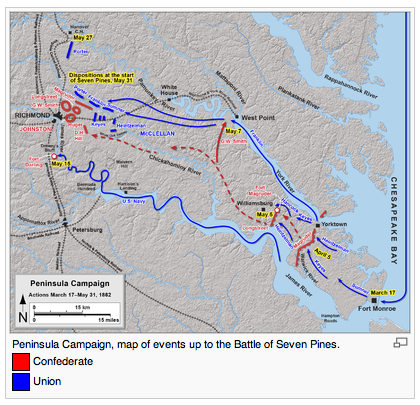 While the Confederate attacks had been thrown back at Seven Pines and Fair Oaks, the severe wounding of the Confederate leader Joe Johnston propelled Gen. Robert E. Lee into command. Lee would prove to be one of the ablest military minds of the war. “General Meagher at the Battle of Fair Oaks” was an 1862 lithograph by Currier and Ives. This print, which could be purchased cheaply by the public, featured the soon to be iconic green flag of the Irish Brigade. 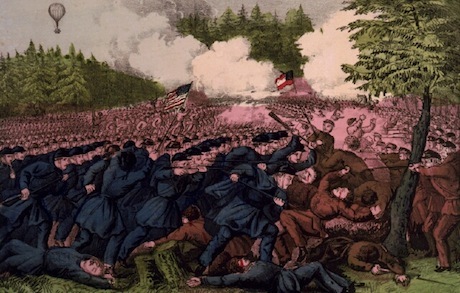 The song “Was My Brother in the Battle” describes a youngster asking a returning Union soldier if a beloved brother has been killed or wounded. Written by the famous songwriter Stephen Foster at the time of the Peninsula Campaign, it includes an homage to the Irish Brigade. The song acknowledges that in 1862 “the flag of Erin [Ireland] came to the rescue of our banner and protection of our fame.” There is also a reference to the “noble Highland host” being “wrongfully outnumbered on the Carolina Coast.” This refers to the Scottish 79th New York Highlanders who suffered badly in fighting in coastal Carolina in 1862. Mainstream music was beginning to recognize that immigrants were increasingly the backbone of the Union Army. Was my brother in the battle where you gained those noble scars? He was ever brave and valiant, and I know he never fled. Was his name among the wounded or numbered with the dead? Was my brother in the battle when the tide of war ran high? You would know him in a thousand by his dark and flashing eye. Did he suffer ‘mid the wounded or die among the slain? Were so wrongfully outnumbered on the Carolina coast? Till he fall among the brave on a bleak Virginia plain? While contending for the honor of our dear and cherished flag. Till the bold and erring foe fell like leaves on Autumn day? Oh! I wish I could have seen him draw his sharp and glittering sword. 1. “Sept. 15, 1861 to Thomas Ewing” in Sherman’s Civil War: Selected Correspondence of William T. Sherman 1860-1865 ed. by Brooks Simpson and Jean Berlin, University of North Carolina Press (1999) p. 137. For a full discussion of the commissioning of “political generals,” see Lincoln’s Political Generals by David Work, University of Illinois Press (2009) pp. 1-76. Sherman appears to have had frictions with at least two of his regiments, the 69th and 79th New York, during the days before and immediately after Bull Run. The 79th reportedly “mutinied.” He was not remembered fondly by the men of either regiment. 2. The Grand Design: Strategy and the U.S. Civil War by Donald Stoker, Oxford University Press (2010), pp. 139-161; George B. McClellan: The Young Napoleon by Stephen Sears, Ticknor pp. 95-192 (1988); “McClellan Organizing the Grand Army” by Phillipe Comte de Paris in Battles and Leaders of the Civil War Vol. II (1887); “The Peninsula Campaign” by Gen. George B. McClellan in Battles and Leaders of the Civil War Vol. II (1887); “Yorktown and Williamsburg” by Warren Lee Goss in Battles and Leaders of the Civil War Vol. II (1887); “Manassas to Seven Pines” by Joseph E. Johnston in Battles and Leaders of the Civil War Vol. II (1887); “Two Days of Battle at Seven Pines” by Gustavus W. Smith in Battles and Leaders of the Civil War Vol. II (1887); “Battle Cry of Freedom” by James McPherson, Oxford University Press; To the Gates of Richmond by Stephen Sears, Ticknor and Fields (1992). 3. The Irish Brigade and Its Campaigns by D.P. Conyngham, McSorley and Company (1867) p. 116. 4. 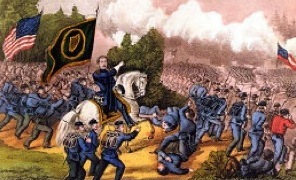 The Irish Brigade in the Civil War by Joseph Bilby, Combined Publishing, (1995). Chapter 3. 5. Memoirs of Chaplain Life: Three Years in the Irish Brigade with the Army of the Potomac by Fr. William Corby (1st Edition 1893) p. 71. 6. Memoirs of Chaplain Life: Three Years in the Irish Brigade with the Army of the Potomac by Fr. William Corby (1st Edition 1893) p. 78.